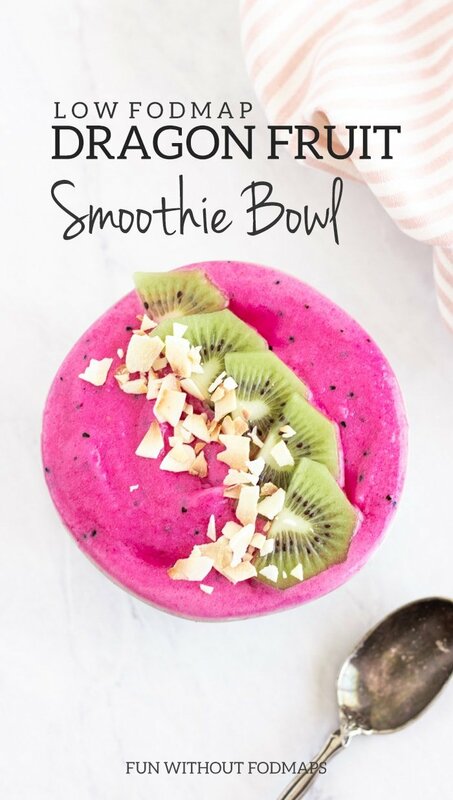 Hot pink (FODMAP-friendly) smoothie bowl? Yes, please! 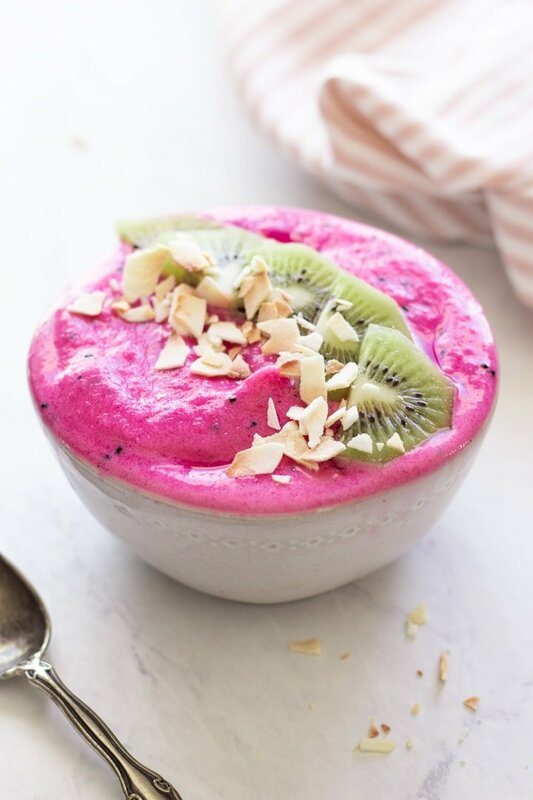 Pretend you’re on a tropical getaway with this colorful Low FODMAP Dragon Fruit Smoothie Bowl. 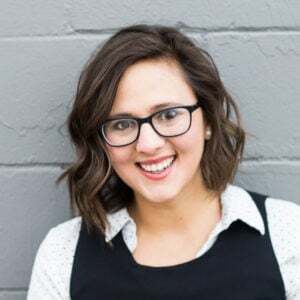 Showcase at least one health-promoting food group mentioned in the Dietary Guidelines like vegetables, fruits, nuts and seeds, whole grains, etc. This month’s theme is to introduce a ‘newer’ ingredient and share it in a healthy recipe – new year, new ingredient. Dragon fruit (aka pitaya) is a relatively new-to-me ingredient. Only within the last couple of years has this tropical fruit become locally available to me in the midwest. When I first saw it in stores, I was super excited because I think it is such a fun fruit! And, it happens to be FODMAP-friendly! Dragon fruit or pitaya is native to Central and South America, but it’s also grown in other tropical regions of the world. 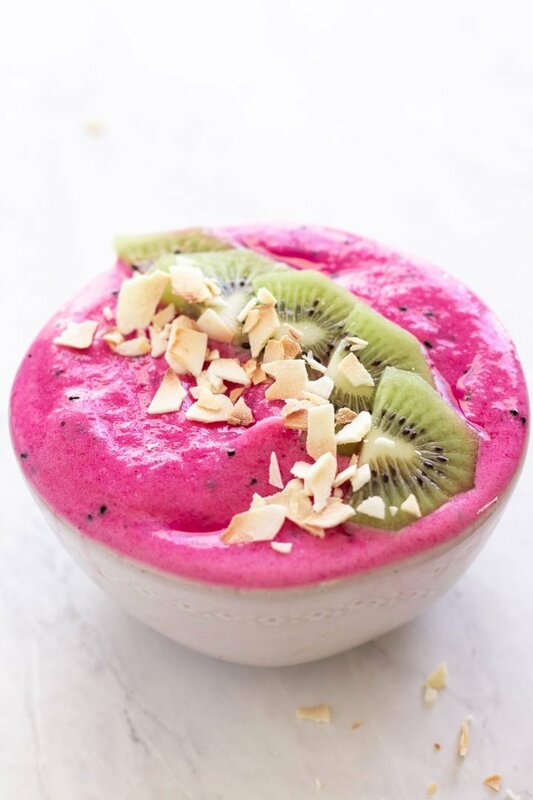 In fact, I ate A LOT of locally-grown dragon fruit in Bali during my yoga teacher training, usually in the form of smoothie bowls – the inspiration for today’s recipe! Pitaya or dragon fruit is hard to miss with its hot pink and neon green spiky-looking shell. The inside flesh is the part that you eat. It can be either white or hot pink and is dotted with little black, edible seeds. The flavor is pretty mild with just a hint of sweetness and the texture kind of reminds me of a watery kiwi. 🙂 Nutritionally, dragon fruit is packed with fiber and vitamin C.
Locally, I am only able to find the white-fleshed dragon fruit in its fresh form. 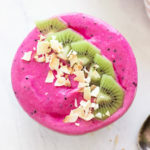 However, I recently discovered Pitaya Plus frozen hot pink dragon fruit cubes at my local Woodman’s and think they’re a really fun way to jazz up smoothies or smoothie bowls! 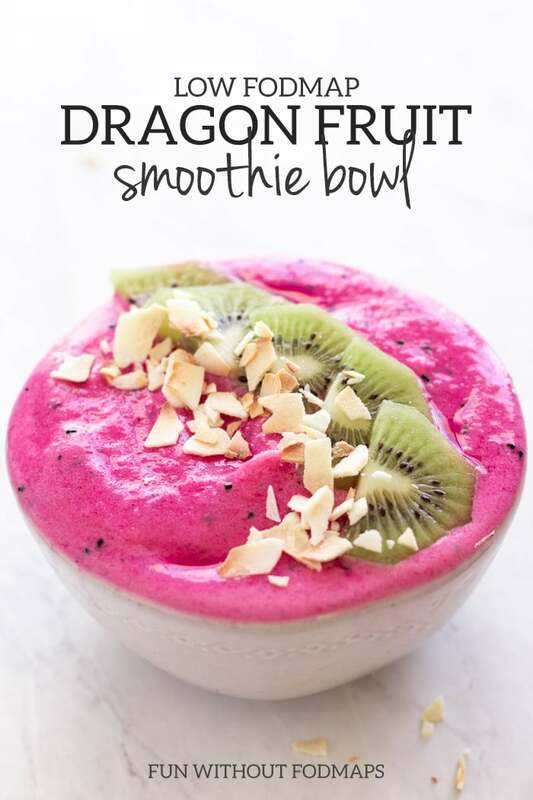 As written, this low FODMAP dragon fruit smoothie bowl features frozen dragon fruit, frozen pineapple, almond milk, and a bit of protein powder. We’re all unique and have different nutritional needs/preferences, so I always like to provide some options. Smoothies and smoothie bowls tend to skew higher in carbohydrates. So, I like to add a bit of protein powder and fat (toppings) to help balance things out a bit, nutritionally-speaking. To date, pea protein and (sprouted) brown rice protein have been tested and have low FODMAP servings (check the Monash University FODMAP app). Also, Stellar Labs Nutrition (in the US) has a full line of FODMAP Friendly certified protein powders, both whey- and plant-based. On a personal note, I am currently using this for a “protein powder” – not tested, but purely peptides (aka broken down proteins). 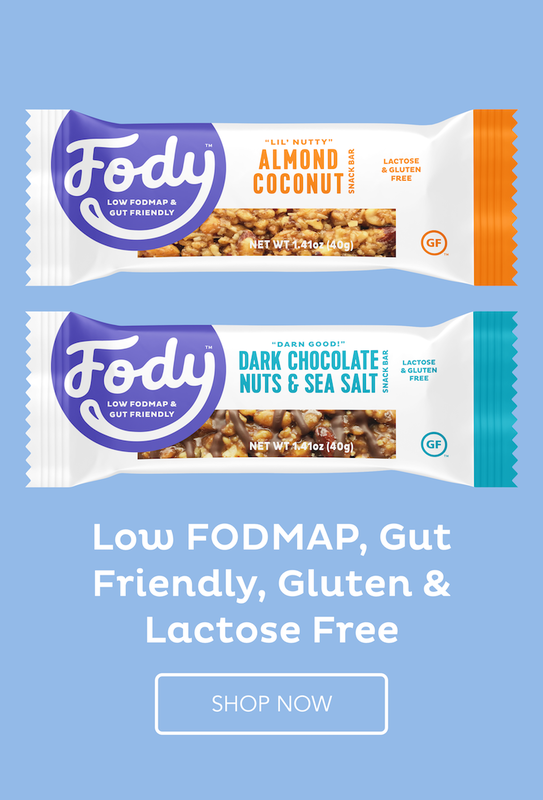 FODMAPs are carbohydrates, so this product shouldn’t be problematic from a FODMAP-standpoint. 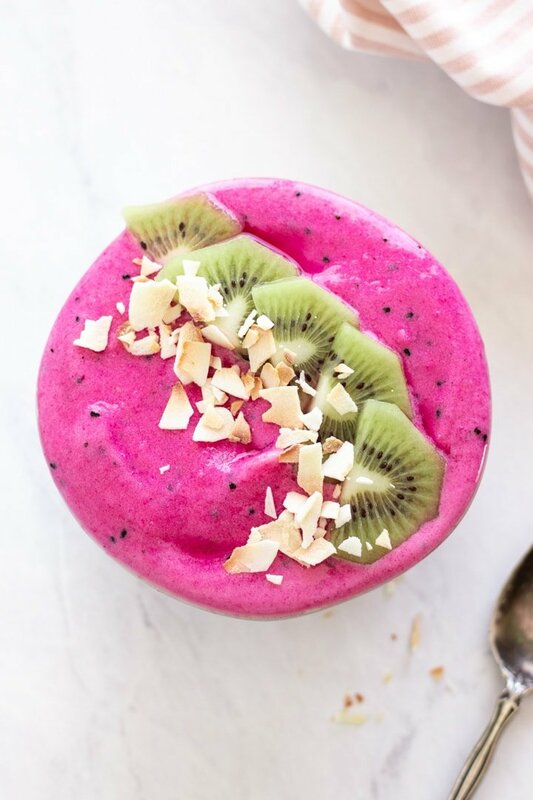 Place frozen dragonfruit, frozen pineapple, protein powder, and almond milk into a blender. Blend until smooth. Pour into a bowl and top with optional shredded coconut and kiwi. Serve cold. Dragon Fruit: FODMAPs not detected by Monash University. The suggested serving is 1 medium or 330 grams. Pineapple: A low FODMAP serving is 1 cup (chopped) or 140 grams. Kiwi: A low FODMAP serving is 2 small (peeled) or 150 grams. THis is absolutely gorgeous!! Bet it’s delish too!